If you are looking to start a fossil business, or enhance an existing one, EXTINCTIONS Business Services can help. 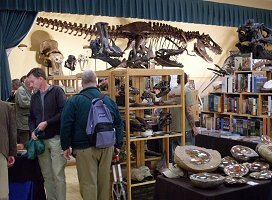 Steve Hess, President of EXTINCTIONS, Inc. has been selling fossils for over 30 years, and founded EXTINCTIONS Fossil Company in 1992. We know the fossil business inside and out - EXTINCTIONS is one of the most respected fossil dealers in the world. We can assist you in acquiring the RIGHT fossil stock, selling fossils for the RIGHT price, participating in the RIGHT fossil trade shows, building the RIGHT website and web presence on the Internet, etc. Everything from choosing the best name for your type of business to a fully-functioning fossil business with employees. Any questions? Please contact us .